Tips for Handling Telemarketers Three Little Words That Work ! — 534 words. Organic food has boomed in the last decade, moving from a tiny niche market to a $17 billion dollar industry. Those who can afford it are buying nontoxic and organic rugs, mattresses, and clothing. Almost half of all households in the US have purchased a water filter of one kind or another. Across the country, people are growing more concerned with the possibility that their food and water could actually make them sick -- and are responding by buying more products with labels like "organic," "green," and "natural." Is something wrong with this picture? — 1,427 words. 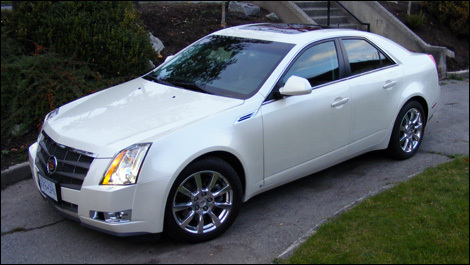 The Cadillac CTS was first introduced in 2003 as Cadillac's entry-level, premium sports sedan. 2008 finds us with a completely new version of this atypical Caddy, more inline with its European rivals. — 1,018 words. Now she’s . . .
Condi doesn’t want to be Iraq. She wants to be a Palestinian state. It has a far more hopeful ring to it, legacy-wise. The Most Powerful Woman in the History of the World, as President Bush calls her, is a very orderly person. — 858 words. Will the courts declare Steve Fossett a goner? On Monday, the wife of millionaire-adventurer Steve Fossett asked a Cook County, Ill., court to declare him legally dead so that the assets in his estate can be distributed. Fossett vanished in early September after taking off on a solo flight from a ranch in Nevada. Despite scouring huge expanses of rugged mountainous terrain, searchers found no trace of him or his aircraft. How do you prove that someone is dead without a body? — 541 words. DUBAI (Reuters) - Al Qaeda leader Osama bin Laden urged European countries to end their military cooperation with U.S. forces in Afghanistan, in an audio tape aired by Al Jazeera television on Thursday. — 539 words. The law promoting outstanding excellence in fighting terrorism — and why you never heard about it. What's up with all the uncharted plane wrecks we're finding around the Sierra Nevada? Millionaire Steve Fossett went missing after he took off from a Nevada airstrip for a short flight. Rescue crews have yet to find the famous adventurer or his plane, but according to news reports, they've discovered at least six "uncharted wrecks" across a 17,000-square-mile swath of the Sierra Nevada—or nearly one a day since the search began. Why are there so many undocumented crash sites around the Sierra Nevada? — 406 words. CARACAS, Venezuela — Several hundred thousand opponents of Venezuelan President Hugo Chavez's proposed constitutional reform marched here yesterday in a final protest before the referendum on Sunday. Opposition political parties and student groups gathered in five points before marching to the capital's largest boulevard, Avenida Bolivar, in central Caracas. — 483 words. CARACAS, Venezuela — Neighbors, friends and family members of young worker and supporter of Venezuelan President Hugo Chavez, José Anibal Oliveros Yépez, who was murdered by a radical opposition group in the regional city of Valencia on Monday, have expressed profound rage and indignation at what occurred saying that his body was even spat on and kicked by his killers, "as if he were and animal." — 897 words. On Sunday 2 December 16 million Venezuelans are eligible to vote in a referendum: all the signs are that they will approve constitutional reforms proposed by President Hugo Chávez. — 583 words. But in the spirit of to its own self be true, the CIA predicts that the Chavistas will win by a 10-13 point lead. A native New Yorker currently residing in Caracas, Eva Golingeer is a Venezuelan-American attorney, writer and investigator. Author of The Chávez Code: Cracking US Intervention in Venezuela (2005) and Bush vs. Chávez: Washington's War on Venezuela. CARACAS, Venezuela — An internal CIA memorandum has been obtained by Venezuelan counterintelligence from the U.S. embassy here that reveals a plan to destabilize Venezuela during the coming days. — 1,091 words. By Anne Applebaum, a Washington Post and Slate columnist. Her most recent book is Gulag: A History. Casualties are definitely down. Other places suddenly seem to need more urgent attention. News coverage is shrinking, as is public interest. All of which may help explain the breath of optimism one can now detect in Washington, and even in some other places, about the war in Iraq. "It will all come right in the end, wait and see," is an expression I've now heard more than once. Other versions of this include "The surge is working," and "Why don't the mainstream media tell the truth about our successes in Iraq?" — 768 words. Since Victorian times, puzzles and games have helped make Christmas a happy time for kids and adults of all ages. Christmas crackers with amusements tucked inside, special games and toys associated with Hanukkah and board games left under the tree by Santa have long been an integral part of holiday celebrations. With this trivia quiz, we’re keeping the tradition alive with 20 challenging questions that will add some cheer and knowledge to a season known around the world for joy and merriment. — 1,270 words. Harold Wright, Doctor of Punology, says The professor discovered that her theory of earthquakes was on shaky ground.